Download the jythonMusic folder (47MB). Unzip the folder on your desktop (or elsewhere). The JEM editor is the simplest and most usable way to run your programs (Windows/Mac/Linux). It is developed and maintained by Tobias Kohn. Go to the jythonMusic folder. 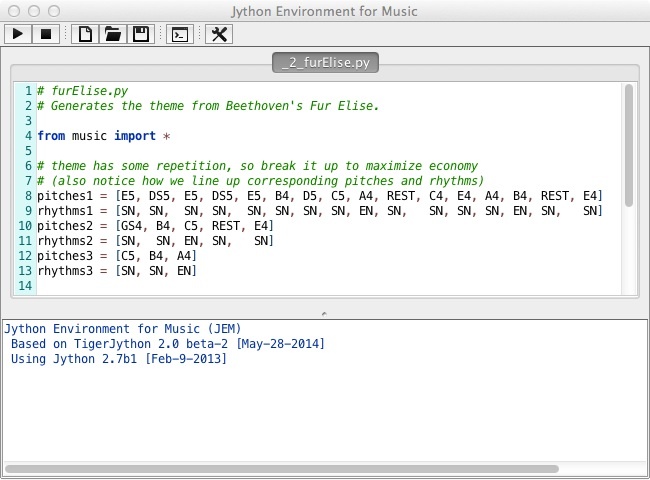 Using the JEM editor to edit and run a jythonMusic program. You may also run jythonMusic programs using the following ways. These are intended for more experienced users, as they involve more detailed setup. Also, they may not necessarily provide better performance.